Page 10 - KaBOOM! News | KaBOOM! A year to remember, recommit and continue to act! As we look back on the KaBOOM! 15th birthday year, it is hard not to feel pride in all that we – the broader KaBOOM! community – have accomplished toward realizing our vision of a great place to play within walking distance of every child in America. 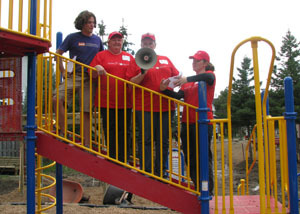 Together we have built 2,072 playgrounds empowering communities across North America to come together for the greater good. We have taken all of our knowledge and made it available – for free – so people can self-organize and build playgrounds at a much faster pace than we can alone, while also building local skills, capacity and social capitol. We have mapped 89,145 playgrounds in our effort to create a nationwide Map of Play, which will in turn illuminate Play Deserts, allowing us to use our resources even more strategically to serve those communities most in need. To that end, we created a mobile app, Playgrounds!, to make it easier for you to add to our Map of Play and find great places to play in your neighborhood. We recognized 151 Playful City USA honorees across the country for their efforts to make their cities more playful. And, with your support, my book, KaBOOM! : How One Man Built a Movement to Save Play, was #4 on the NY Times Bestseller list, enrolling more communities, mayors, teachers and parents in the movement to save play. With so much to celebrate, it’s easy to get lost in the excitement. But we must not forget that KaBOOM! was founded out of a tragedy – the lost lives of Iyesha and Clendon, who suffocated to death while playing in an abandoned car because they didn’t have a safe place to play. That story, as reported in the Washington Post, inspired me to bring people together and do something: build a playground. This year, we turned another tragedy into hope in Phil Campbell, Ala., whose town was nearly destroyed by the largest tornado in Alabama history. Twenty-six people were killed including two students and a teacher from Phil Campbell Elementary School. Along with homes and businesses, their only playground was shredded by winds reaching over 210 MPH. Residents from Phil Campbell are still struggling to put their lives back together, but on December 17th they got a new playground, thanks to support from Disney, and two Imagination Playground™ in a Box™ sets, thanks to the generosity of donors from across the country. Our mission to help communities build playgrounds is also driven by the fact that outdoor play is critical to the health and well-being of our children, yet today's kids have fewer opportunities and less time to play than any previous generation. As we look ahead to the next 15 years, we must recommit to and act on behalf of Iesha and Clendon and all of the children in our lives to ensure that they have a great place to play and that play is prioritized at home and in school. Whether that means organizing a playground build in your neighborhood, joining our online community on Facebook or donating to our broader efforts, make a resolution to help advance the cause of play. Oh, and don’t forget to have some fun along the way! "I was already running a playgroup, but the KaBOOM! webinar, Get Outside: an All-Weather Guide to Outdoor Playgroups, made me take the initiative to set up an 'Outdoor Playgroup' within our existing playgroup. Usually we try to meet outside anyway, but during winter in New England, that's not always the first impulse- many people just want to stay inside- we also have a lot of southern people who have relocated to this area and they find it hard to get out with the kids. So, I figured starting 'Outdoor Playgroup' in the winter was a good idea. We've had really great turnouts to most of the events, and now that it's getting warmer I'm hoping that attendance will increase as well. One member who came to our outing this week said they hadn't been to a playground since the fall." Play it forward with a donation today to help us host more online trainings to inspire people like Courtney to brave the weather and play outside in all seasons. "I got involved with KaBOOM! through an employee at our local YMCA. I feel that providing a safe place for the kids in the community is a great idea. I am a grandparent of 7 boys and all they do is video games or baseball. By having a place where they can play, it will get them some much needed exercise. 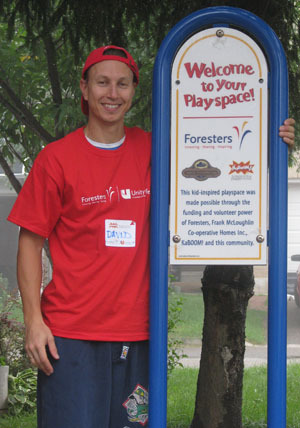 Becoming a volunteer is a rewarding experience because you know you helped build a safe place for families to their kids to play. 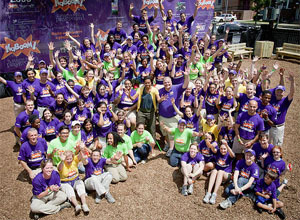 I also met many wonderful people who took their time out of their job or household chores to come and build a fun place. It was fun with music, laughter and a joy to see the kids playing on their new playground." 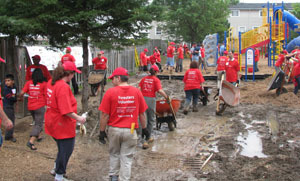 Play it forward with a donation today if you’ve ever had a great experience on a KaBOOM! Build Day like Leo. 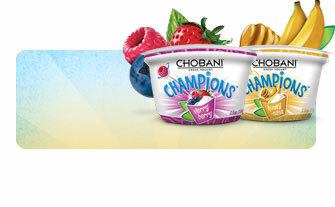 Chobani Champions tour travels the East Coast bringing the gift of play! A couple months back we announced that Chobani Champions was supporting our SAVE PLAY campaign by granting three Imagination Playground™ in a Box™ sets to local community organizations. KaBOOM! is happy to report that the tour is over and three communities in Hartford, Conn.; Miami, Fla.; and Boston, Mass. 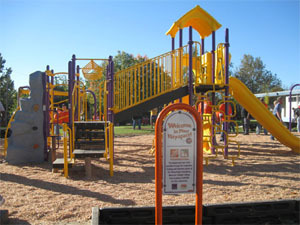 now have innovative mobile playgrounds! Read the full story and see the photos from the Champions Tour Bus on the Chobani blog.